The New Jersey Comic Expo is in Edison this weekend and returning to the expo is Joe Caramagna, writer for many Marvel titles such as Guardians of the Galaxy and Ultimate Spider-man. However, one of his more unique works may tickle the fancy of fans of one of the oldest genres in fiction, the western. Part biographical and part fiction Caramagna takes people on the journey of Wyatt Earp's life beyond anything seen in the films about events leading up to the O.K. Corral story many know so well. His series "The Further Travels of Wyatt Earp" take you to Earp's adventures after the O.K. Corral and show what a man with the reputation for justice and a clear understanding of right and wrong can lead to. 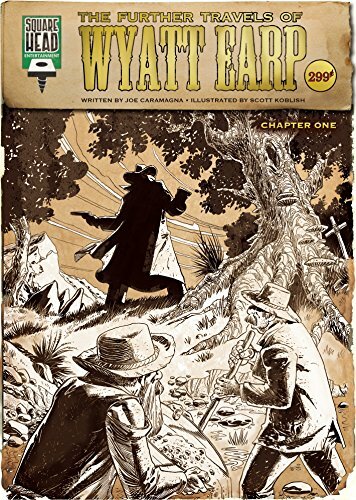 Men like Wyatt Earp have been written about for a long time and he will likely continue to be in stories like Caramagna has given us here. If you are in central New Jersey and can make it out to the Expo come check out Caramagna and all the other creatives coming to the New Jersey Comic Expo. To see who else is coming, you can read about it all here.